S occer devotees in ATX are crossing their fingers in hopes that Austin will someday see a hometown-based MLS team -- but for now, they’ll have to keep watching big games on the big screen. The 2018 FIFA World Cup kicks off June 14 and runs through mid-July, and soccer fans will be flocking to the best spots in Austin to raise a friendly glass and watch some non-American football. And since it’s taking place in Russia, it’s all going down during daylight hours. Though Austin’s sports bar scene may not be as robust as some cities, we’ve got the good food + good vibes + good beers thing down pat. We’ve outlined the best sports bars & destinations in the city to drink some suds and watch some soccer below; keep an eye on this page for more special events & details as they’re announced. 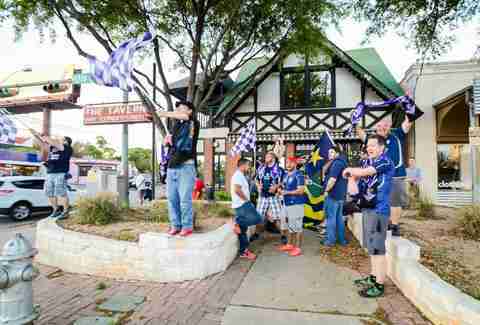 One of the longest continuously running establishments in Austin, The Tavern is packed anytime there’s a game on and that goes double for soccer. It’s the official home of FC Barcelona Penya Austin, opens early for Arsenal Games and hosts gameday watches for the Austin Aztex so it makes sense that they’ll have their TVs tuned in. While you’re there, have some of the White Wings -- bacon-wrapped chicken with jalapeño dunked in Buffalo sauce -- and you might not even care who wins. Part hostel, part coffee shop, part event space, part cocktail bar… Native Hostel is at the intersection of everything cool, and hosts fun and quirky events regularly. They’ll be screening all World Cup games (as befits their local and international clientele), and there'll be free game watch parties with drink specials as well as discounted rooms with the promo code Kick15. They’re also doing a 1-on-1 soccer tournament in their indoor soccer court, if that's your jam. 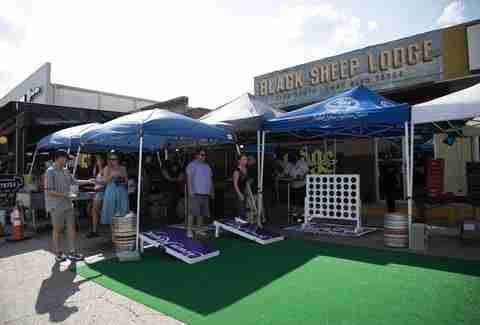 Black Sheep is a spot with regulars; beer signs on the wall, shuffleboard, drink specials every night, and a pub-style food menu all combine to make it a neighborhood fave. It’s most well known for its burgers -- big beefy affairs -- and extensive craft beer selection, but the dog-friendly patio is a hangout during spring and summer nights, and they’ll be showing any game that falls during their regular open hours. So, the afternoon games. With their big beautiful taproom, community tables, string lights, and concrete floors, Lazarus Brewing has channeled the spirit of Austin brewing: the spot is kid- and dog-friendly, too, and they’ve got coffee and wine for the non-beer drinkers. Grab a taco and a brew here, and watch the games live in their new “Cool Store” -- a reference to the long-time east Austin building they replaced. Specials: Free coffee or beer if your team wins, and the person with the most team wins gets a Patron Saint glass and free beer for life. This place might be right across from The Butterfly Bar but the feel here couldn’t be more different: Haymaker has stacked sandwiches, cheap drink specials daily and a great television view from every community bench seat in the house. 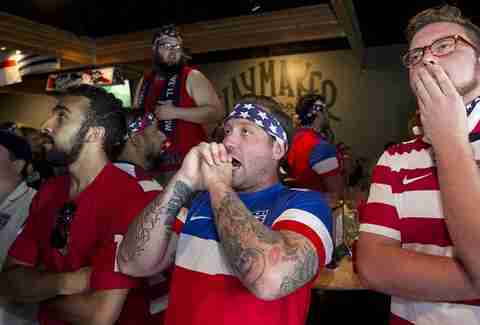 It’s widely regarded as the best place to watch soccer due to its affiliation with the American Outlaws, the US soccer fan club, and they’ll be showing World Cup games once it’s down to 16 teams, though popular matchups may also warrant an early open. Squatting awkwardly in a parking lot, this bar has nonetheless managed to build a reputation for football fandom. Soccer pennants line the walls of Mister Tramps in all their riotously colored glory, and the place frequently hosts special events around matches. If there’s a major game on somewhere in the world, you can find it at Tramps; for this year’s World Cup, they’ll be opening at 7am to provide patrons with breakfast and match viewings. Irish bars are always a safe bet for a solid soccer watch party, and both locations of B.D. Riley’s are no exception. 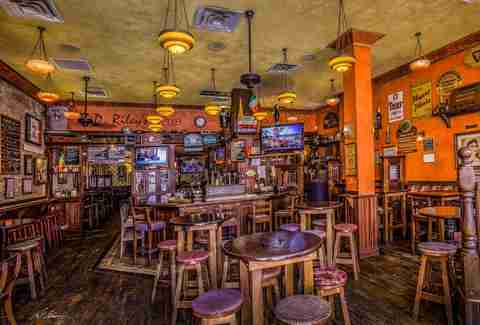 The Mueller location is the official home of Austin’s Liverpool fans, but both locations feature handmade bars imported from Ireland that beg for the ol’ belly up. 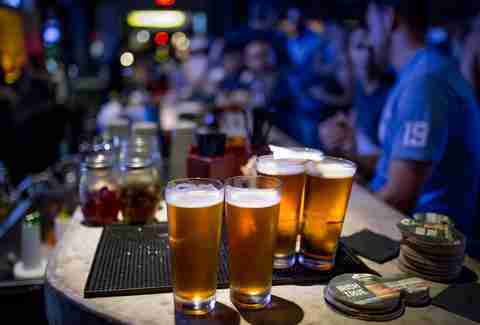 They’ve got a wide selection draft taps and friendly bartenders willing to pull you the perfect pint. The TVs around each corner and a good pour of Guinness are all you’ll need while cheering on your favorite futbol player. 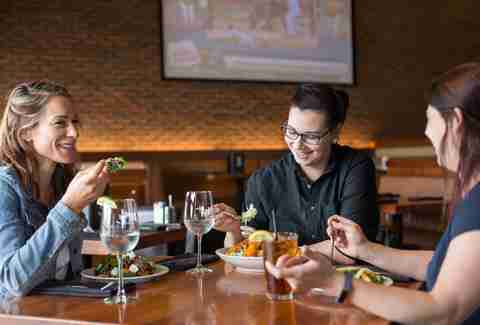 Equal parts hearty American restaurant and bar, Cover 3 is mini-chain with spots in Austin, Round Rock, and San Antonio that holds its own on both fronts. There’s a special almost every day -- fish and chips on Friday, half-price wine bottles on Wednesday, a weekend Bloody Mary bar -- and both Austin locations open for business at 11am, meaning you’ll be able to catch all the afternoon games here. Soccer lovers may come for the games, but their tagalongs will be equally happy with the award-winning burgers and crafty cocktails. Eschew your regular coffee shop routine and head to Easy Tiger with your fellow soccer fans. Famed for its baked goods and craft brews, Easy Tiger is opening its Beer Garden early for World Cup viewing parties; pull up a seat at one of the long community bench tables while the weather is still a cool 85 degrees. Pastries and draft beer are served before 11am, at which point the full menu comes available. Make sure to check their calendar for opening times, as they’ll vary depending on game schedule. This long-time haven for sports fans has expanded in the last couple of years, much to the delight of sports fans. In all three locations, you’ll find a TV on every wall, drink specials, and a bevy of bonafide soccer enthusiasts; they’re also paired up with Turf N Surf po-boy, which means you’ll have access to Southern-style fried fish, chicken, and shrimp plus snacks. 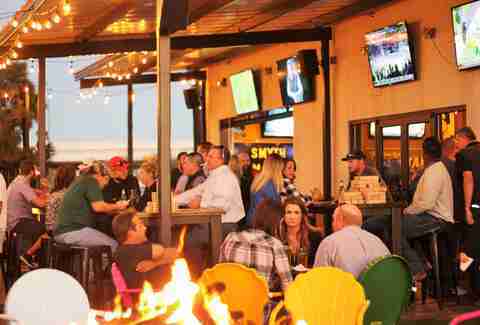 No matter what match you’re into, Uncle Billy’s will be showing it at full volume on the patio on multiple HD TVs. They’ll be open for all morning games -- including the 5am-ers. Breakfast, barbecue and burgers are on the menu (depending on time of day), and along with on-site craft beer, fans can find specialty cocktails (like Bloody Marys) made with Uncle Billy’s spirits. You won’t find beer-soaked floors and expired chips here; helmed by veteran restaurateurs, this leveled-up sports bar offers craft beer and cocktails alongside a gourmet pub food menu put together by a pedigreed chef whose past exploits include a stint at Uchi. BaseCamp’s large, comfortable booths scattered around 13 big screen TVs make it an ideal spot to post up on match day. 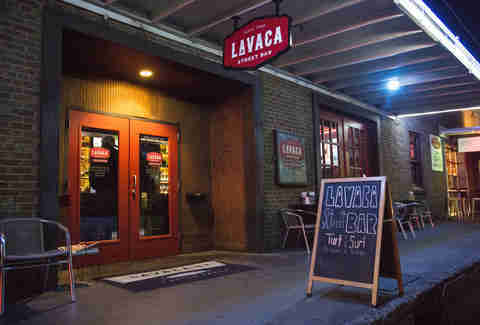 With Fado gone, Austin's other Irish bars are stepping in to fill the gap. Jack and Ginger’s plans to open early for all of the games, sweetening the deal with breakfast drink specials, and they’ll be be serving their elevated pub food menu as well, so devotees can indulge in soft pretzels, pizzas, or a stacked sandwich during game time. With five locations in Austin, you’re never too far from Little Woody’s particular brand of lovable sports bar. There are sports on the telly year ‘round along with daily drink specials that include fireball shots and buckets of beer. (Friday is steak night if you’re feelin’ classy.) Though they likely won’t have special watch parties until the grand finale, you’ll be able to catch a game here if you ask. 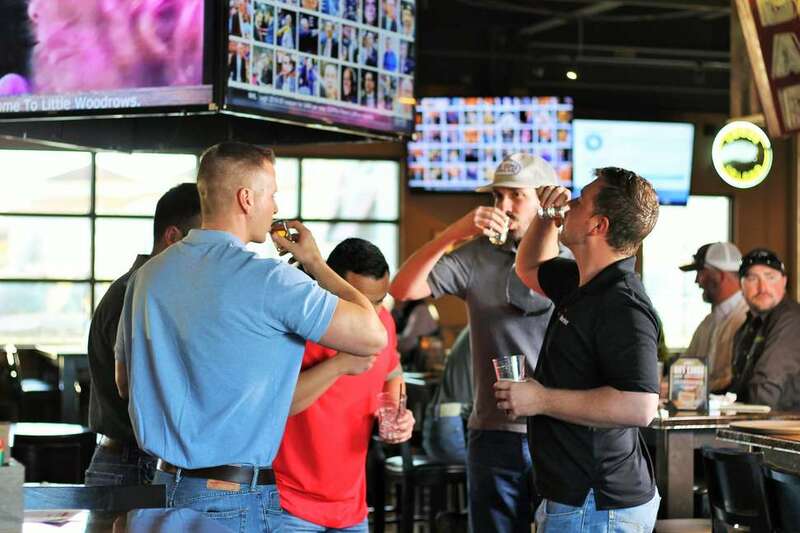 Specials: Game-day deals vary by location; for example, the Burnet Road bar has specials on Heineken and Dos Equis, but the 6th Street bar has none. Call for details! With promises “to show all matches on the big screen!” Nickel City might be the darkest, coolest place to pull up a stool and watch your favorite team do their thing. They’ve managed to juxtapose a retro, neighborhood bar vibe with craft cocktails; come here for a Boilermaker… or for a perfect Negroni. During games, they’re offering a specialty cocktail menu with items like a Caipirinha made with Leblon Cachaca and a Mezcal Mule. The food trailer onsite, Delray Cafe, slings burgers, dogs, wings, and all the tater tots you need to fuel a futbol carb-load.